It's results that count and today was a fine example of that old clich�, Queen's never really got going for any length of time although in parts they produced some nice moves and ultimately the defence was strong enough to hold out against the experienced and skilful Bankies. That defence saw an enforced change today as Des McKeown was off on a works related Arctic Safari, his place was taken, surprisingly, by Denis Boyle, who it has to be said turned in one of his best performances in any position for Queens. The first twenty minutes of the match was dominated by the visitors with an early indication of things to come when in two minutes a spectacular overhead kick had to be palmed onto the bar by Mathieson and away for a corner. Then only five minutes later livewire Martin Glancy turned Ronnie McQuilter in the box only to fire in a shot which Mathieson did well to get down to block. Queens being limited to two Jon Sunderland efforts, one from long range as he tried to capitalise on the 'keepers position well off his line, however Sunderland's effort found the terracing as it flew well over, his second effort from the edge of the box again missed the target. A good chance was wasted for Queens in sixteen minutes when Jon O'Neill elected to head a cross goalward as Warren Hawke was arriving behind him and in a better position to get some power on the effort. Mark Angel showed today what he is capable of with a couple of good runs, firstly he broke through on the half hour mark and as he was about to cross was brought down on the edge of the box. 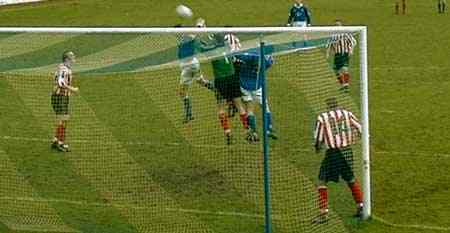 At the other end Jon Sunderland had to put in a brave stooping clearing header from the toe of a Bankies forward. Then things started to liven up for Queens as O'Neill and Connell began to work together more effectively, in thirty five minutes O'Neill was put through by Connell but just as he was about to shoot the ball was cleared. Two minutes later though and Queens were in the lead, a Mark Angel cross was headed against the underside of the bar by Warren Hawke and as it bounced up of the goal line Jon O'Neill got to the ball first and headed it down and into the net for the opener. Then in forty minutes Peter Weatherson, who had a quiet game today, almost was successful in chasing down the on loan Bankies 'keeper, the ball somehow missing the inrushing Weatherson just as the keeper cleared it. The final action of the half was a Peter Weatherson turn and shot which beat the 'keeper but could only find the side netting. The second half was to start and finish with a gilt edge chance for Queens, the game half was only a minute or so old when Warren Hawke was bundled to the ground by Wishart inside the box, Warren stepped up to take the penalty himself but the on loan from Oldham keeper guessed correctly and dived to his right to block the shot, it came back out to Hawke who had another attempt, see photograph below, but this was blocked, then to Peter Weatherson and his shot was deflected into the path of Mark Angel who could only blast over the bar from close range. Denis Boyle was having a very solid game at left back and was combining well when he could break forward, fifteen minutes into the half he and Weatherson played a defence splitting combination of passes which saw the young Irishman put in an excellent ball only to see it taken off Hawke's head by Rab McKinnon. Clydebank were having the best of the exchanges now and Queens were really on the back foot for long spells, a couple of free kicks were given away on the edge of the Queens box but fortunately neither came to anything despite a few free-kick experts in the visitors ranks. Whilst Clydebank were pressing any Queens attacks were breaking down quite easily as only Weatherson was staying upfield and the rest of the team were playing deep. John Connolly made a double substitution and pushed the side further forward with Stephen Pickering replacing Mark Angel and being asked to play as a left winger and Peter Weatherson being replaced by Martin Hughes to allow Jon O'Neill to push further forward. Andy Aitken will have a moment for his scrapbook today as he must have beaten at least four opponents in and around the centre circle and he produced a mazy dribble just to demonstrate his close control. Queens were certainly a lot more lively and direct after the substitutions, a free kick was awarded for some blatant obstruction and from the left wing Jon O'Neill swung in a tremendous curling cross to the back post which was met simultaneously by Warren Hawke and the Bankies 'keeper, the ball just squeezed by the post for a corner, see photo below. Stephen Pickering was another player making a rare appearance that impressed for the period that he was on today, he looked to combine well down the left, working well with Jon O'Neill. 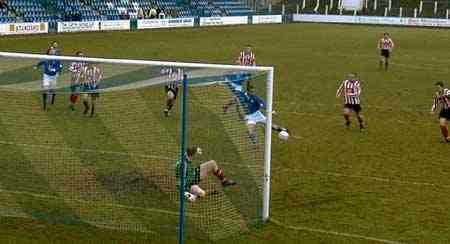 The Bankies then had their best chance of the match with only minute remaining as Jon Sunderland was turned down the right and the resulting cross struck first time by the Clydebank striker only to see it beat Mathieson but skim by on the wrong side of the post for him. A tactical substitution was needed and on came Alan Hogg for Warren Hawke and within seconds the young striker was to get Queens final gilt edge chance of the match as he was put through on the keeper with time and space to spare, unfortunately though Hogg delayed just a touch too long and the keeper closed him down enough for his eventual shot to be beaten away. The final whistle went moments later and Queens recorded their fourth straight victory and moved into fourth spot in the league just four points behind Arbroath in second place and with a game in hand. The return match takes place on Tuesday evening at Cappielow and Queens can be sure that another tough 90 minutes awaits, Clydebank are a decent side with some good individual players and a tough midfield that today dominated for long spells.